It's been a long time since either Beau or I have had a puppy. I was in junior high the last time I had a 'real' puppy and Beau was about that age as well. Honey almost doesn't count as a puppy because she was between 4-5 months old and was pretty much trained, house-broken and didn't play with toys. 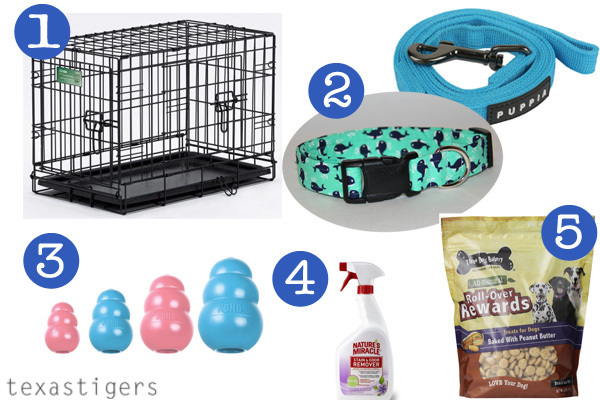 So I came up with my 5 must-haves for the puppy stage so far. 1. A crate - this is a serious must have. Crate training aids in house-breaking, gives the pup a safe spot to call their own. (Diesel already is comfortable to go lay in his with the door open when he wants a break or a place to lay down and chew his toys) It also gives you a safe spot to leave your pup when you leave the house or just when you can't keep a 100% eye on them so you don't come back to chewed up furniture and potty accidents in your den. We also use the crate as a time-out spot when the pup and children start winding each other up and they need a break from each other (a spot for the pups time out not to put the children in!) We also have a crate mat to put inside the crate to give him something comfy to lay down on. 2. A collar and leash - mostly a no-brainer. This collar is just adorable though! We also just purchased a gentle leader for Diesel that will eliminate his pulling. He isn't too bad now but he's soon to outweigh most of the family so this will be a big deal later and I want to prevent him from learning bad habits. 3. Toys! My favorite saying is "a tired puppy is a good puppy." Plus you want to give your pup a safe option of something to chew on that isn't your furniture or shoes. The first week Diesel would try to chew on whatever he could get his mouth on, we'd quickly re-direct him to a toy and praise him for chewing on his own toy. I love these kongs because you can fill them with a treat and they'll keep the pup's attention for longer. Other good options - a squeaker toy, ropes, dog bones and balls to play fetch with. 4. A spray cleaner - because there will be a few accidents no matter how good ya'll both are. 5. Treats - I love the treats in the mini-size because they are perfect for training so you aren't giving him a huge treat each time your pup sits when you tell him too or having to tear a larger treat into small pieces. Of course you also need food and water/food dishes but I figured that went without saying. What are things you found you couldn't have done without at the puppy stage?